This advanced Excel calculator is designed to simultaneously manage Amortization Schedules for Multiple Loans. As you know, in most cases people as well as businesses don’t have just one loan. However, if you are looking for a great calculator for only one loan (or mortgage) then instead of this one we recommend using this: Excel Amortization Schedule Calculator for Loan Repayments. It has some additional features (like extra repayments or interest compounding options) which are not included in the Multiple Loan Calculator. An average consumer usually maintains multiple loans in parallel. When the number of loans gets bigger than 2 or 3, managing all repayments can be quite challenging. Our new calculator should help you get on top of your loans. 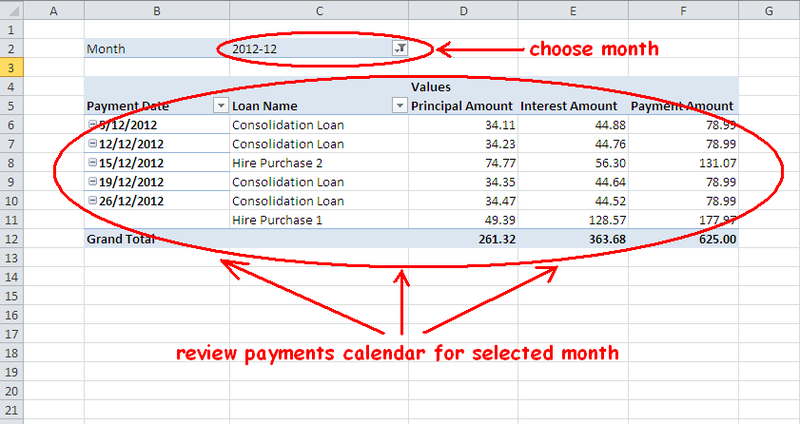 It will enable you to generate clear and easy to read repayments calendar. That way you will never ever overlook or miss a single loan payment. Off course, assuming that you have enough money available in your bank account. Our Excel calculator has a form of amortization schedule which splits the repayment amount into two main parts – interest and principal. This calculator also gives you visibility over all loans periods separately and combined as well. That way you should see exactly how much will be your repayment, interest and principal amounts. It will greatly help you with your advance cash flow planning. Next, you should be able to identify periods when total repayments get higher than usual and prepare you for such event accordingly. With Our Excel Calculator for Multiple Loans you will be able to do all the things above and much more! After keying in all the entry data, you can see the result immediately. 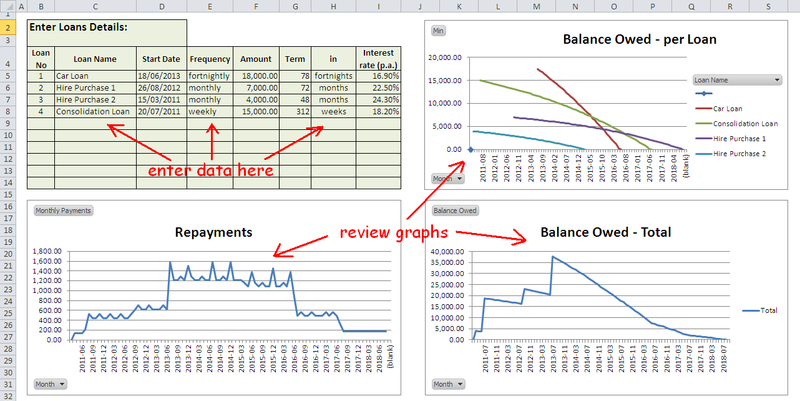 With this excel calculator you will know exactly how much you owe (loans principals) at any given time. You will also know exact amounts of your combined monthly commitments throughout the entire loans term. Before you decide to take out any new loan, just enter its details into your existing loan portfolio. You will immediately see how it affects your future cash flow. 1. Can you really afford any extra loan? If so, how big? 2. How long before some of your existing loans expires and releases available cash flow for a new loan? 3. Will there be any months when loans with different repayment frequencies combine and put an extra demand on your outgoing cash flow? 4. When will you become debt free? 5. How any new loan will impact your ability to meet repayments? 6. How will any additional loan extend the period before becoming debt free? 7. How much interest on top of principal will each loan cost you? 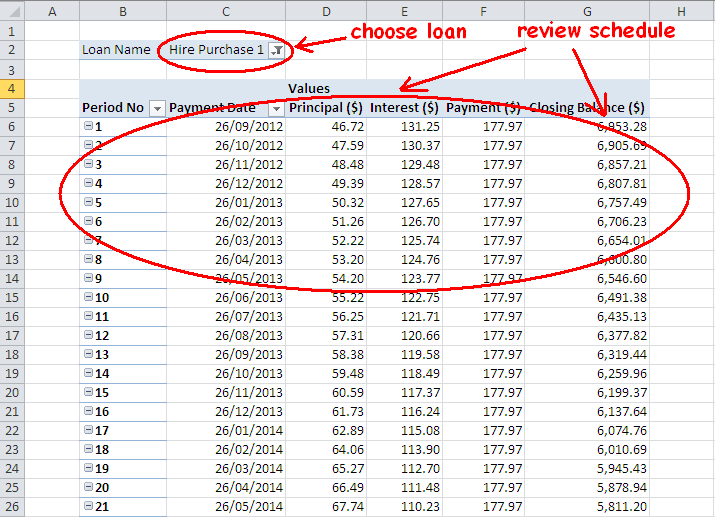 Note 1: Once you enter all loans parameters, click on Data -> Refresh button to recalculate the results. Note 2: Please follow the default layout for entry parametrs. Also, use loan numbering from 1 to 10 sequentially in ascenting order. For no loans leave all fields empty. Any deviation from default format may cause the calculator to not function properly. We would love to hear your feedback about this calculator. If you have any comments, suggestions for improvements or if you find any error in the calculator, please do let us know. We truly appreciate your valued opinion. I am holding a mortgage for a relative that misses a lot of payment and pays late and odd amounts. Do you have an amortization schedule that would help me fairly track his payments and interest? He doesn’t pay according to his schedule at all, and I don’t know how to manage it fairly. After inputting new data into the first worksheet, the data refresh option isn’t available, its grayed out. What should I do? When you open a new Excel file on your PC, the Excel sometimes wants you to accept the file. It shows a bar under the Menu. You just need to click “OK” or “Accept”.